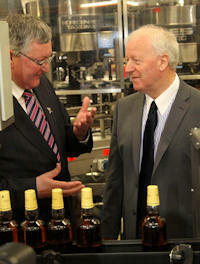 THE BENRIACH Distillery Company was delighted to welcome Fergus Ewing, the Scottish Government’s Minister for Energy, Enterprise and Tourism, to its headquarters and bottling plant at Newbridge, Edinburgh, today (Monday November 21). The company, which owns the BenRiach and GlenDronach single malt distilleries, gave Mr Ewing a tour of its premises and a presentation on its activities worldwide. Acquired last year, the Newbridge Bond, Scotland’s specialist contract bottling company, has five bottling lines including a purpose-built line for low-volume/high-value product and Scotland’s fastest miniature bottling line. Working with some of the world’s leading spirits brands, it has the capacity to produce 2 million cases per year, it can store 3 million litres in its vats and can accommodate up to 150,000 cases in its bonded warehouse. In April 2004 the company acquired BenRiach, south of Elgin, in a deal worth over £6m. Four years later, it also acquired GlenDronach near Huntly, Aberdeenshire. It employs a total of 80 people at its two distilleries, Head Office and bottling plant. Annual turnover is £15.1m, with net profit of some £2.6m. The BenRiach Distillery Company Ltd. has three shareholders – industry veteran Billy Walker and two South Africans, Wayne Keiswetter and Geoff Bell. Its whiskies are available in over thirty countries. Mature markets include Europe, Scandinavia and the USA, while emerging markets are opening up in Russia, Kazakhstan, Ukraine, the Phillipines and Vietnam. Over the years it has won a number of prestigious industry accolades. In 2007 BenRiach won “Distillery of the Year” at the Malt Advocate magazine whisky awards and in 2009 it was “Distillery of the Year” at the Whisky magazine Icons of Whisky Awards. And earlier this year the company won nine awards for GlenDronach and BenRiach – two trophies, and a total of seven gold, silver and bronze medals – at the International Wine and Spirits Competition in London. Last month it augmenting its award-winning range of whiskies by unveiling the new 21 year-old GlenDronach “Parliament”. Matured in a combination of the finest Oloroso and Pedro Ximinez sherry casks, it continues the GlenDronach tradition of offering fruit-laden intensity in its single malts. The new expression is named “Parliament” after the colony, or “parliament” of rooks that have been nesting in the trees overlooking the GlenDronach distillery for almost 200 years. Born in Dumbarton in 1945, Billy Walker graduated from Glasgow University in 1967 with a BSc Honours Degree in Chemistry. After spells with Ballantine’s, Inver House Distillers and Burn Stewart, in 2004 he set up his own venture - the BenRiach Distillery Company – which led to the acquisition of BenRiach and GlenDronach distilleries. Over the last seven years the company has resurrected “sleeping giants” BenRiach and GlenDronach, bringing a range of innovative and ground-breaking malt whiskies to the market. Billy is one of the most recognisable characters in the Scotch Whisky industry where he has now been involved for over forty years. He is a Master Blender and a Master of the Quaich - the highest honour the Scotch Whisky Industry can bestow. Enterprise Minister Fergus Ewing said: "Our whisky industry is a national success story and makes a huge contribution to Scotland. Exports are a large part of this and it’s encouraging to see the latest figures showing that they are up 22% in the first half of the year to stand at £1.8 billion. "BenRiach is to be congratulated for playing its part in this and developing its brands so well over the last few years - and contributing to Scotland's sustainable economic growth in the process." Billy Walker said: “My colleagues and I were delighted to welcome Fergus Ewing to Newbridge in his capacity as Scottish Minister for Enterprise.